Aquaponics is a marriage between aquaculture and hydroponics. 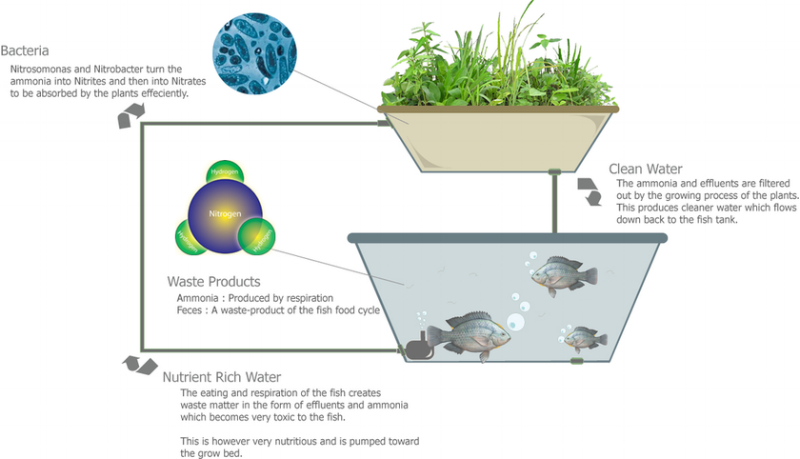 The technology is based on a system of aquaculture in which the waste produced by farmed fish or other aquatic animals supplies nutrients for plants grown hydroponically, which in turn purify the water. The method is a closed loop system so the water is returned to the fish tanks and the process is continually repeated using 95 percent less water, in half the germination time, while producing 2-3 times the yield of traditional farming. The vegetables, fruits and the fish continue to grow in the process, enabling a harvest of both freshly grown produce and fish. Also, because of weather conditions in various parts of the world, greenhouse-like operations are essential if a year round food supply is to be sustainable. The technology is not new. However, if it's used for commercial purposes and/or year round operations, then both the knowledge and expertise of greenhouse operations and maintenance is necessary. This is a technology that has the opportunity to attack world hunger and poverty if it is strategically utilized and developed appropriately. For this cause, TAG is creating developing world AP systems using local resources. The systems, which TAG puts in place, will be constructed of materials that are available on location. Using on-site materials will eliminate the necessity of bringing in materials and will enable those monitoring and operating the systems to have a better understanding of composition and operations. TAG’s strategy is to install AP systems in orphanages and schools, which have staff personnel who will attend the training program and learn the installation and operation of AP systems. The trainees will then become the mechanism through which TAG will receive on-going feedback once the installation has been completed and TAG has left the region. Having received feedback, TAG will return to each location to ensure future development and expansion of the technology. It will enable TAG to replicate at home the conditions and resources we have to work with in a particular country or region. This is critical to the success of the design and types of systems to be installed in various parts of the world.